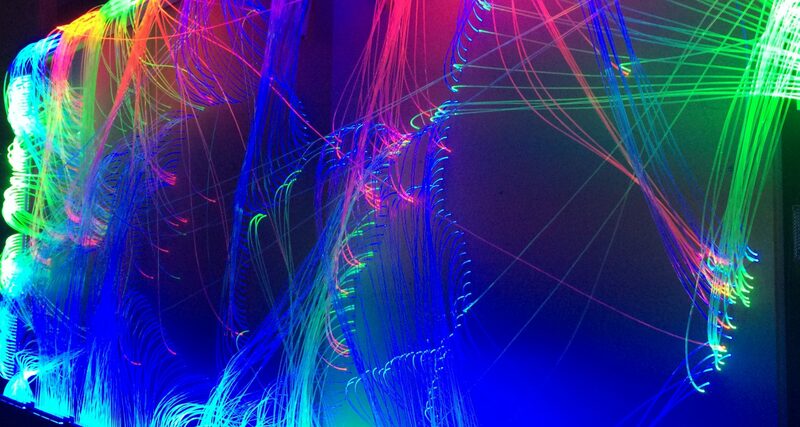 This is the first blog post in a series about the curation of sound. Can you curate sound? Why would you do that, and how can curated sounds be experienced? We will answer these and pose many more, as well as curating some sounds ourselves. This post explores how sound can be used to capture the sense of a place, and in this case study, how sound can be curated to represent an entire country. One of my interests and hobbies is creating electronic music. I have no great ambitions, I just enjoy playing with sound; creating it, capturing it, manipulating it, and arranging it. Recording sounds on location is fun too. In the past I have created podcasts, including one on archaeology, which I tried to make as atmospheric as possible by recording ambient sounds from archaeological sites. When visiting new places while travelling sometimes I like to record how the place sounded, as well as taking photographs. It evokes a different kind of feeling for me over video, which can sometimes be intrusive. Listening back to these sounds, sometimes years later, evokes memories and helps me to experience those places again. Sound, when curated, can be a powerful and emotive tool. The sounds that we hear around us can of course be recorded. In 2019 these recordings can be of incredible fidelity, including binaural and 360° sound to give the listener a complete sense of immersion in the listening as well as viewing experience. As well as being recorded and played back, sounds can then be chosen, edited into ‘samples’, ordered and even performed. With the right conceptual framework, sound can be curated and made available for re-use by musicians, artists, and anyone who finds them interesting and useful. A common way to organise and play back recorded sounds is with a device or app called a sampler. One of the samplers that Tom uses is the Digitakt. It is a box which can be used to capture sounds directly or import sounds created elsewhere, edit them, and arrange them into patterns for performance or recording. Created by Swedish company Elektron the Digitakt can be loaded with “sound packs“, groups of pre-made sounds, many of which are contributed by musicians and sound designers from around the world. 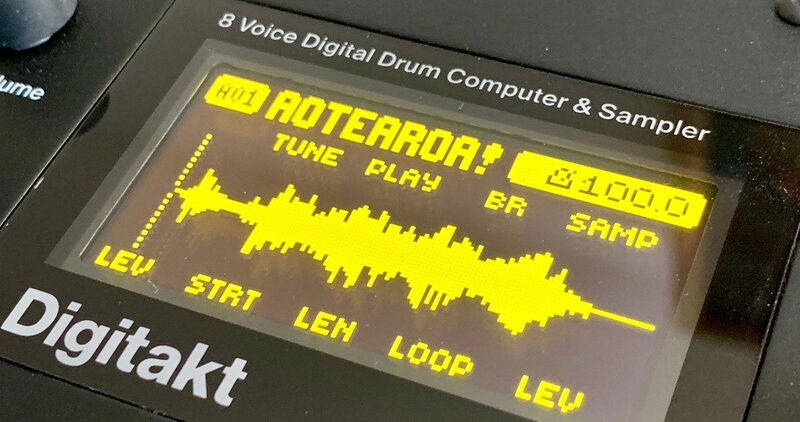 In autumn 2018 Elektron announced the Aotearoa sound pack. The concept resonated with Tom immediately, having travelled around New Zealand. Aotearoa is the Māori name for New Zealand. We’ve all seen images of this enchanting part of the world, but what does New Zealand sound like? This Sound Pack, curated by Radek Rudnicki, is a rare collaborative effort to answer that question. The concept of curated sounds to bring the sense of a place to life is fascinating. Even more so, that this is a sound pack aimed at musicians and sound designers, using a collaboration of students from Te Rewa O Puanga – the School of Music and Creative Media Production at Massey University, New Zealand. The sounds were carefully curated. The concept was to capture the “spirit of New Zealand”, specifically the “sound of nature (wind, wave and sea) and the sound of man (traditional and industrial) in beautiful harmony and dissonance”. Led by lecturer, sound designer and musician Radek Rudnicki, the students made their own recordings and edited them into short samples suitable for samplers such as the Elektron Digitakt. The finished Aotearoa Sound Pack was made available by Elektron for free, allowing new works to be created from those sounds. The samples use the standard WAV format which can be used by any sampler or music software. 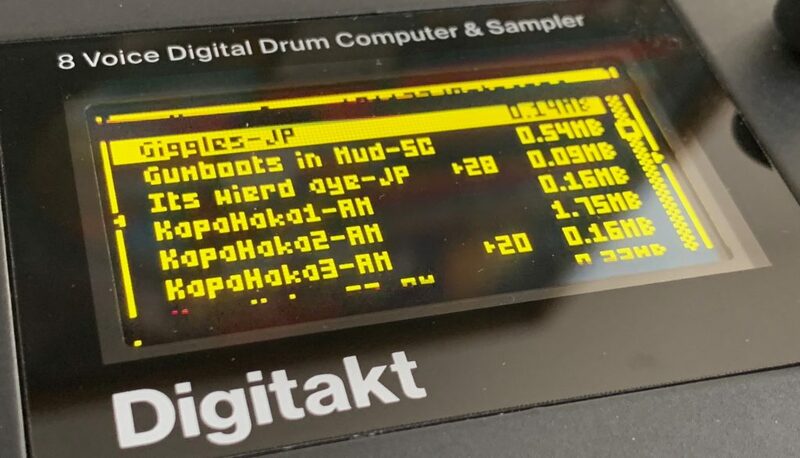 We were really taken by the Aotearoa sound pack and spent some time playing with the samples ourselves, layering and arranging (sequencing) them on our own Digitakt sampler. Having travelled around New Zealand, many of the sounds resonated with us, bringing back memories of our journeys. Manipulating those curated sounds, treating them with echo and reverb, and playing them on a piano keyboard made for a rather ethereal and musical experience. We could imagine curated sound packs being used in physical spaces, perhaps as a sound collage, accompanying physical exhibits or still imagery to evoke or reinforce a sense of place. Sound is often the missing dimension in exhibitions about places. We decided to contact Radek via Twitter to find out more about the curatorial process used in the creation of the Aotearoa sound pack. Tom: It says on the Elektron website that you created the sound pack to capture the “spirit of New Zealand” – and more specifically the “sound of nature (wind, wave and sea) and the sound of man (traditional and industrial) in beautiful harmony and dissonance”. How did you and your students begin to narrow down the sounds? Did you brainstorm in a workshop or were people free to think about it themselves and present candidate recordings? Radek: Hey Tom, yes it was a bit of both. Students had a brief to make samples containing the sound of New Zealand. Each student submitted 10 samples and wrote about them, and their approach, in an essay. I then selected the samples best suited for Digitakt specifically. They were selected based on variety of environment, source, timbral quality to be as diverse as possible. The diversity of approaches by students were really cool, so that made the sample pack quite unique. We talked about it quite a bit during the workshops. Tom: That’s really good to know. Following on from your mention of diversity, were there any cultural sensitivities in using the Maori Kapa Haka and Taiaha samples, considering their possible reuse around the world? Radek: Yes given they were recorded and played / performed by students, it was their choice and their representation of their cultural sensitivity. It also went through extensive approval procedure at the university. We discussed this during the class as well. I encouraged them to think about the audience, and what will people think of New Zealand, how they imagine it and what students want people to think as well. Some wanted to show dark side of NZ some classic sounds etc. Wonder how do you find this pack yourself? Tom: It’s great that the cultural representation was considered so carefully, and good that the Maori samples were recorded by Maori students on your course. Having the backup of a university review I’m sure gave confidence about the pack’s public release. We have found that the pack really does represent NZ for us, and we’re glad that the ‘darker’ side is represented along with the more well-known sounds. We’ve travelled around NZ, including some of the smaller towns, and many a smile was had previewing the samples, as they evoked memories. In fact, that’s what inspired us to ask you these questions. We’ve also found the sounds to be versatile musically, from the percussive sounds of coins, lighters, beer cans, to deeper bass sounds like the “bunker hit” and the Purerehua. So many sonic possibilities. What tips would you have for another group wanting to create a curated sound pack like Aotearoa? Tom: Do let your students know that people the other side of the world are enjoying their work and are interested it. We see it as important work in the world of curation, and sound packs like yours/theirs could be a model for other places to allow people to access or engage with their sonic environments. Good luck with your new cohort and the next sound pack. If you could start the sound pack again would you do anything differently? Radek: Not really. I think this year I will ask students to bring the samples to class earlier in the semester and exchange / show them to whole cohort to get feedback, load them sooner to the Digitakts, so they can hear what is working better earlier in the process rather than leaving it to the last minute. That will hopefully step up the quality and amount of good and useful samples. I have only 12 students this year doing this course so I might ask them to submit 15 each and select the best 64 from these, if Elektron will be keen to have Aotearoa vol 2 that is! Tom: We certainly hope that there will be an Aotearoa vol 2! Thank you Radek for the opportunity to interview you and we wish you luck with your course. Please thank your students too. Here’s a fun piece we assembled using samples from the Aotearoa sound pack, which we selected based upon memories of a trip to Wellington, New Zealand, in 2017. We loaded the samples onto our Digitakt sampler and let the machine decide what order to play each sample and how each sample should sound in terms of pitch and tone (for those in the know – conditional trigs in combination with an LFO modulating pitch and filter frequency). We will continue to explore sound curation in future blog posts. Thanks to Radek Rudnicki for talking part in our interview, and thanks to his students and Elektron for opening our eyes and ears.